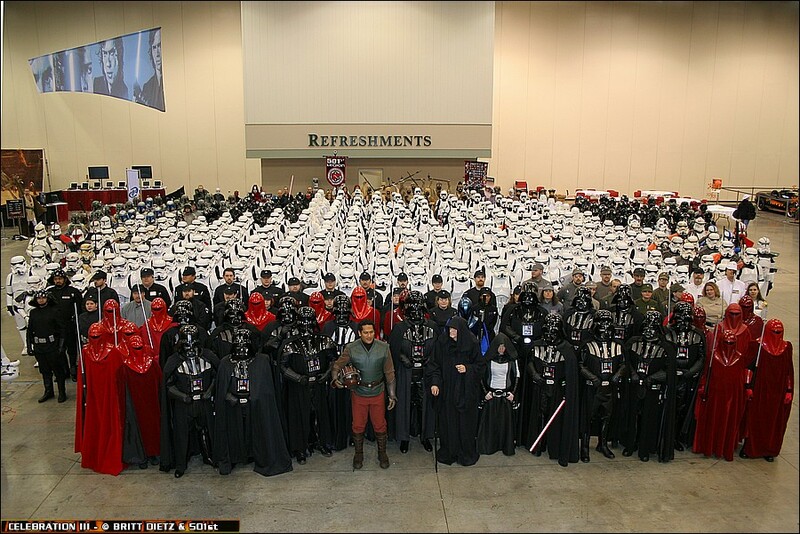 With the abundance of conventions throughout the world, it only seemed natural to one day have a massive Star Wars convention. Star Trek, Comics, Sci Fi, ANIME, and what seems like a million other pop culture topics all had big conventions, but Star Wars was lacking in that department aside from the inclusion in one of the other existing conventions. But it was clear from the popularity and size of Star Wars at the San Diego Comic Con Convention that Star Wars needed it’s own venue. 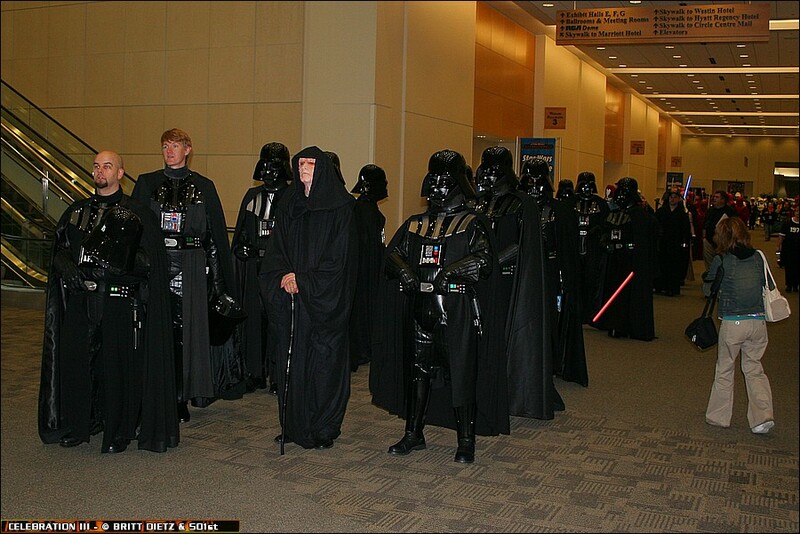 Finally, it all came to light with the very first Star Wars Celebration convention put on by LucasFilm for the fans in May of 1999 in Denver, Colorado. The first Celebration (called CI) was held to coincide with the release of the first Star Wars Prequel movie Star Wars Episode I: The Phantom Menace. Since then, there’s been 3 more Star Wars Celebration conventions in the United States and two overseas in Europe and Japan. 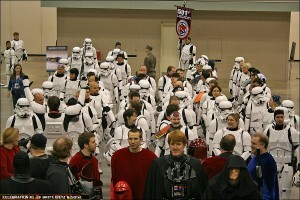 On August 12-15 of this year (2010), the latest Star Wars Celebration (CV or Celebration 5) is scheduled to happen in Orlando, Florida and will be the first Celebration to happen again in the United States in 4 years. 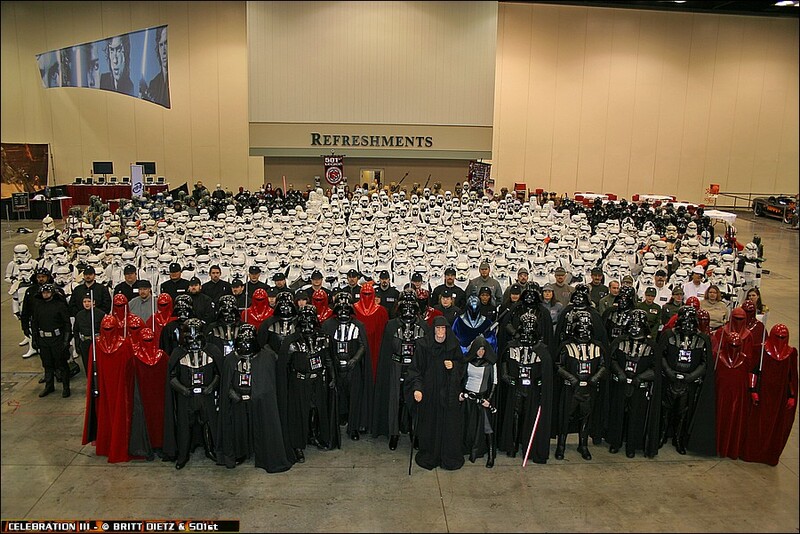 Sadly, I will not be attending Celebration V this year, but to celebrate and remember past Star Wars conventions, I’m going to be posting some fun stories from previous Star Wars Celebrations as the photographer for the world famous 501st Legion. 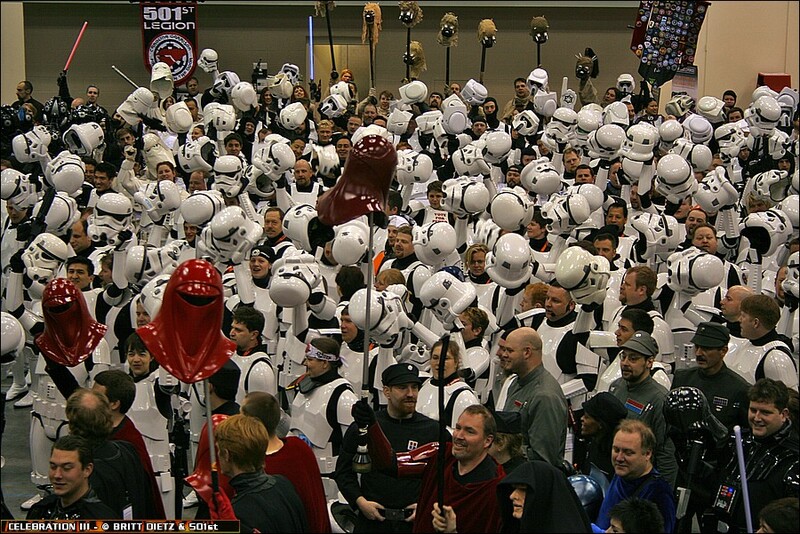 Naturally, the Celebration Conventions are the largest gathering of 501st from around the world. Many times, the 501st are even used as volunteers for events, not just for show but to also do line guard duties and much more. 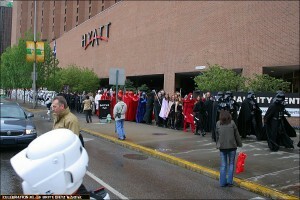 At the Star Wars Celebration III convention that was held in Indianapolis, Indiana, in April of 2005 the 501st was used extensively along side the convention center staff to help out. 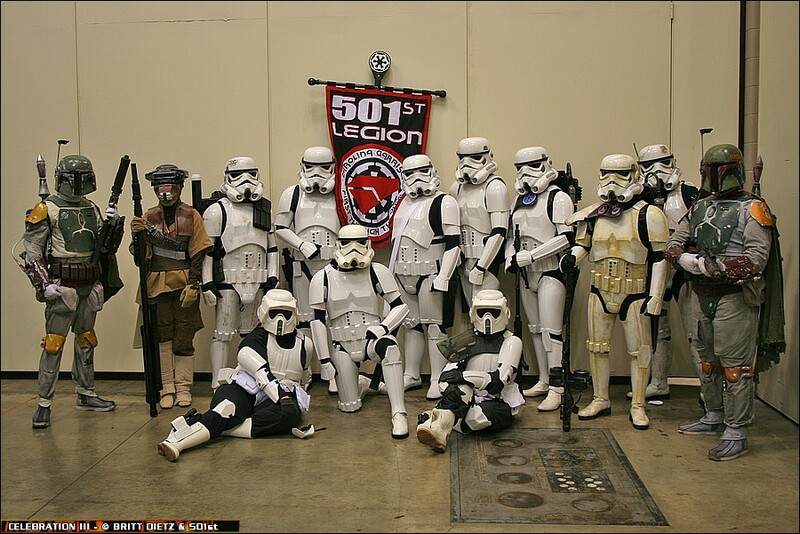 That meant that the 501st was there in very large numbers as the call went out from around the world for 501st members to come out to Indiana. 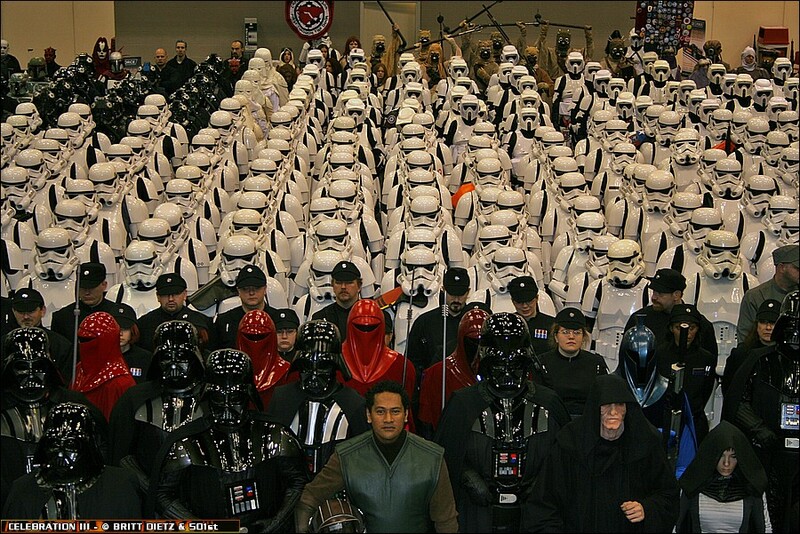 At the time, it was the most amount of 501st in one location, so naturally the 501st Group photo that is a tradition at all events the 501st attends (no matter where in the world the event is) was going to be a massive undertaking. 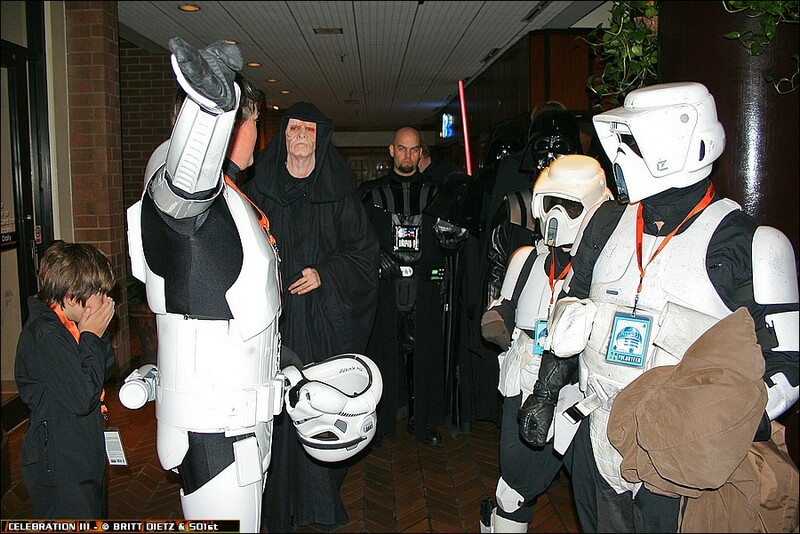 I was honored to be selected as the official photographer for the 501st that year, and I spent the entire Celebration III walking around snapping shots of 501st members (and pretty much anyone in costume) during the 4 days the convention went on. 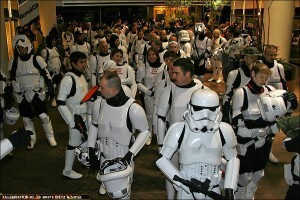 There were over 34,000 people at Celebration III, so the amount of costumes was incredible. Every type of costume you could imagine from the Star Wars universe was represented there, even obscure costumes like a Hoth Wampa (a snow creature) and even a Scout Trooper with fake legs on a Speeder bike. Naturally, I was quite busy running around to capture all the action happening during the Con and the various events the 501st was putting on or helping with, but little did I know how crazy the 501st Photo would be. 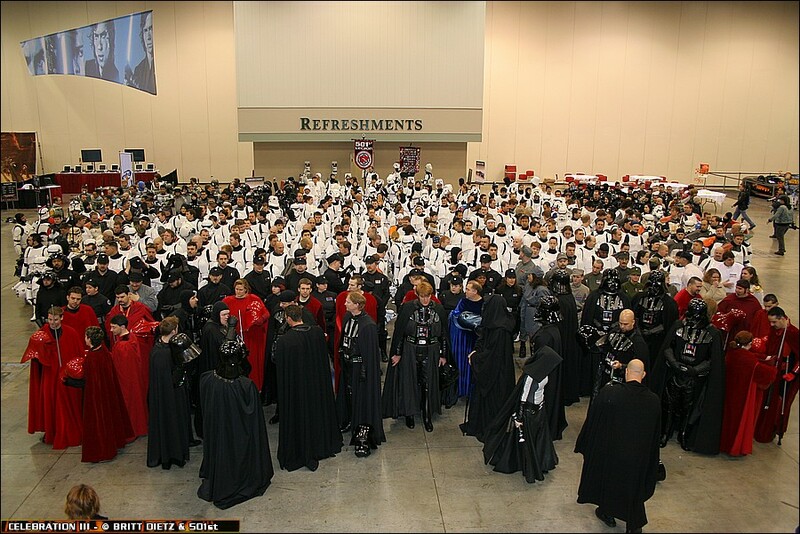 The idea was for the last day of the Convention, the 501st would assemble on the steps of the nearby RCA Dome Stadium (which was demolished in 2008) next door to shoot the large amount of people. 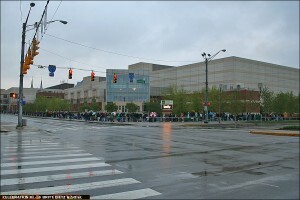 It had worked out great for the previous Star Wars Celebration II that was also held at the Indianapolis Convention Center, so the plan was set in motion to shoot there. 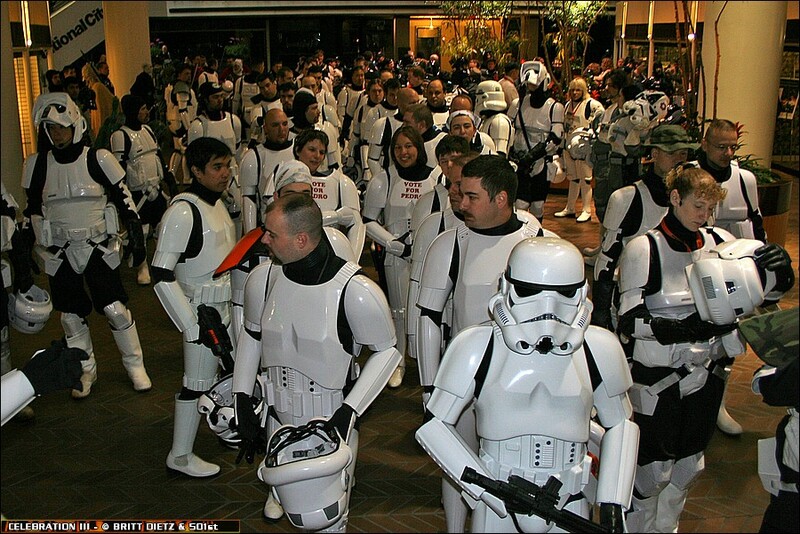 I was to arrive very early in the morning to help coordinate the massive gaggle of 501st members and corral them to the steps where I’d take the epic photo. 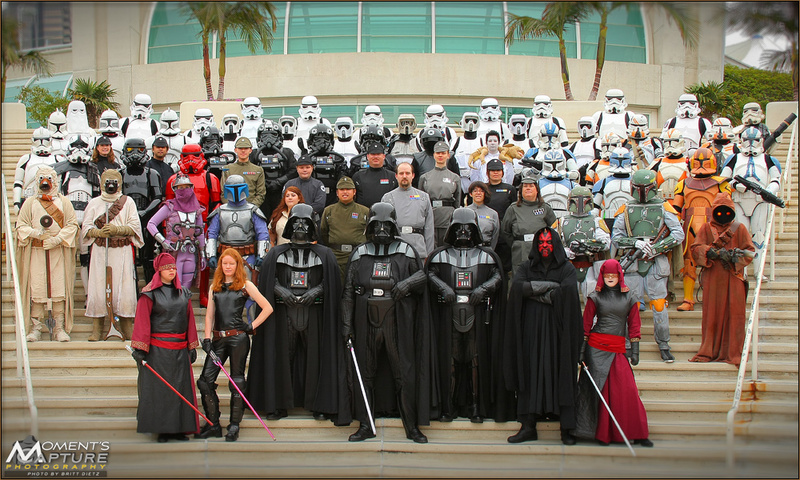 Since they were on steps, I wouldn’t need to use a ladder or cherry lift to shoot the photo, so much like the San Diego Comic Con Convention 501st group photos, it seemed pretty easy enough! The day before the photo was to be taken, it had been lightly snowing in the morning, which was the only worry I had, but it seemed like the weather would be better the next day. Everything seemed to be going as planned until we all woke up that morning and walked down to the convention center, and freezing along the way. While it wasn’t snowing, it had been raining most of the night, and the temperature was dropping more so than expected. 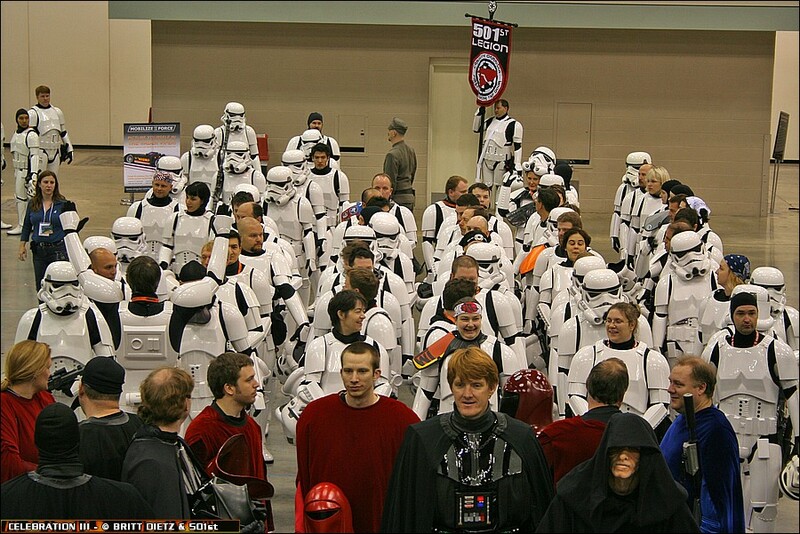 As the first few 501st members started to gather, we started to realize this icy cold freezing weather could be a huge problem. Even with these at times elaborate costumes on, everyone from Darth Vaders to Bounty Hunters were feeling the freezing cold and the moist air. Usually it takes a good half hour for all the members to be collected into on location before we can start setting up the shot, so myself and some of the 501st lead members knew we couldn’t have them all standing around outside in this frigid cold weather. A decision was made to move the waiting area into the nearby lobby of the Hyatt hotel across from the convention center. Myself and a few others stood outside directing people who were heading to the RCA Dome Stadium in the lobby, and during this time I was taking photos of the random groups of characters that were arriving. Before too long, I noticed my camera was starting to sound funny, not something you want to have happen when you’re supposed to shoot this massive photo. After a little bit of investigation, I realize the freezing weather was affecting the camera, and I noticed frost starting to form on the lens. I immediately went into the lobby of the Hyatt to try and ‘defrost’ my camera and get it out of the cold. It was then I realized that this very easy plan for a photo wasn’t going to be so easy anymore with this rapidly getting colder weather outside. Once the camera had warmed up a bit, I started to take some photos of the massing costumed characters into this large lobby. It was starting to fill up fast, and I could see that the Hyatt staff was getting antsy about the large amount of people suddenly filling their entire lobby. 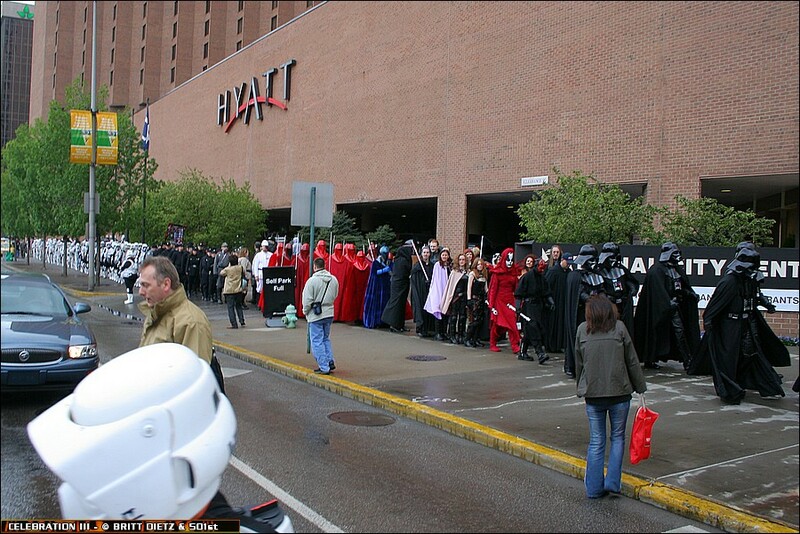 Although it was early in the morning, hotel staff was having to squeeze through groups of Stormtroopers and Boba Fetts, and they were getting very annoyed. I went on a mission to locate the head of the 501st, Tim, to figure out the next plan and alert him to the problem with the camera freezing. He was in a Stormtrooper costume himself, so it was rather difficult to find him when it’s basically a needle in a stack of needles. Eventually with some help I located him and we started to evaluate our options. He agreed that the RCA Dome was looking to be a problem with the cold weather and that everyone was freezing outside, but that was the only option at the moment of a location large enough to shoot that’s nearby. 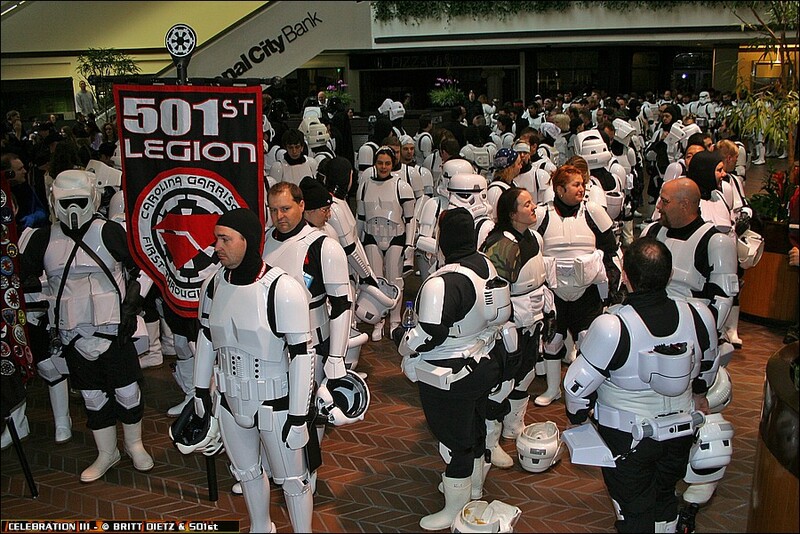 And if that wasn’t causing problems enough, we were in a race against time for when the Convention opened and a lot of the 501st members had to be at their posts for their volunteer duties. We considered every option we could think of, but each one would require being outside in the cold or walking too far. To make matters even worse, the Hyatt staff was done with being frustrated with the now overwhelmingly huge crowd loitering in their lobby, and they started to tell people they needed to leave. 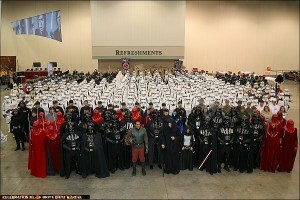 There was close to 400 people in the lobby at this point all antsy to get the photo done. Now in a race for time and a location, we had to make a decision quickly of where to shoot. I had remembered from the previous days of the Convention one of the larger rooms inside the Convention Center that was called the ‘Fan Room‘ because of all the various booths and vendors for the 501st and other Star Wars fan groups along with a lot of activities for kids and fan displays. This is also where the near life size X-Wing fighter was located along with several Star Wars inspired cars. But the center of the room was mostly cleared, and it was a pretty gigantic space that was used for home-built R2-D2 droid races the previous days. I mentioned this room as a possibility to Tim to which he immediately asked me to go see if it was possible. I ran over to the convention center, which was still closed, and told one of the security staff at one of the main entrances the problem. I had a Press/Media badge on, so I was allowed early entry, so I made my way into the Convention Center and to that room. Everything seemed really perfect, the whole middle area of the room was completely empty, and it was a large space that could easily fit everyone. Running back to the Hyatt Hotel, I found Tim once again and told him of how perfect that room would be. After we went through the pros and cons of shooting in there versus the RCA Dome steps, we made the executive decision to shoot in the convention center. Tim and I quickly went back over to one of the side entrances to the convention center and let one of the very confused staff members know what’s going on. It was probably very in our favor that he had no idea what to do, because looking back now at the logistics and nightmare it must have been for the convention center staff to let in a good 400+ people into the convention center before it was open without really being able to check everyone’s badges would have stopped our plans from happening. But, thankfully the guy said okay to us, so we went back to the hotel and to a very angry Hyatt staff who wanted everyone to leave now. We quickly lined up everyone by the type of costume they had which took a little bit of time. 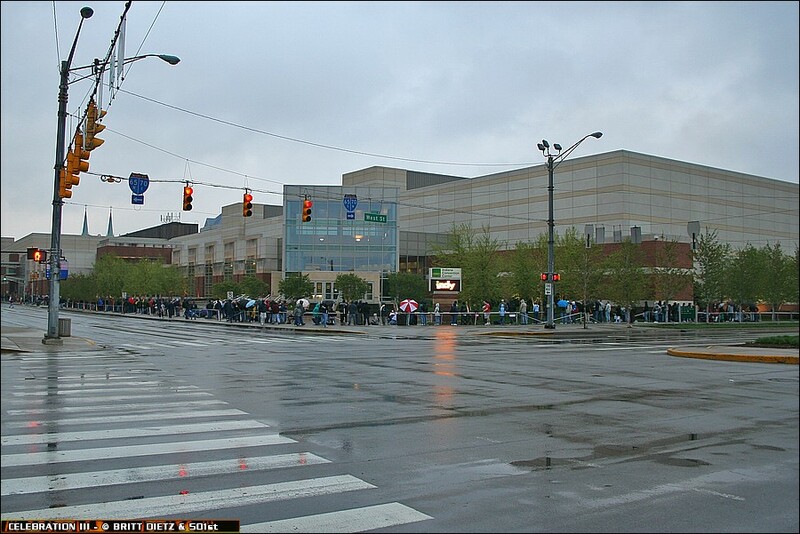 Finally, we had everyone get into a 2 person single file line, and I led the group from the hotel back into the freezing cold and across the street into the convention center. I’m sure that convention staffer who we’d talked to before didn’t quite comprehend the massive amount of people we were going to bring in because you could see the panic in his eyes. We were still racing against the time that the Con was to open, and already behind schedule by a very lot. Normal convention goers had already started to line up to get inside, and many of them wanted to get photos of the unbelievably long line of Star Wars characters stretching from the convention center all the way to the hotel still. The line of people was holding up the traffic that was out in the morning, and now bystanders were stopping to look at the massive line of characters. There was a pause for a little bit as we let everyone catch up in this massive procession of Star Wars, and once we finally reached the side doors the wide-eyed staff member manning the door came out to greet us. The side doors opened and the staff started to let us into the convention center while trying to keep out the random convention goers who just wanted to tag along to see what’s happening or get into the convention center early. That didn’t work all that well, and a lot of people ended up getting in which would be pain for me a bit later. 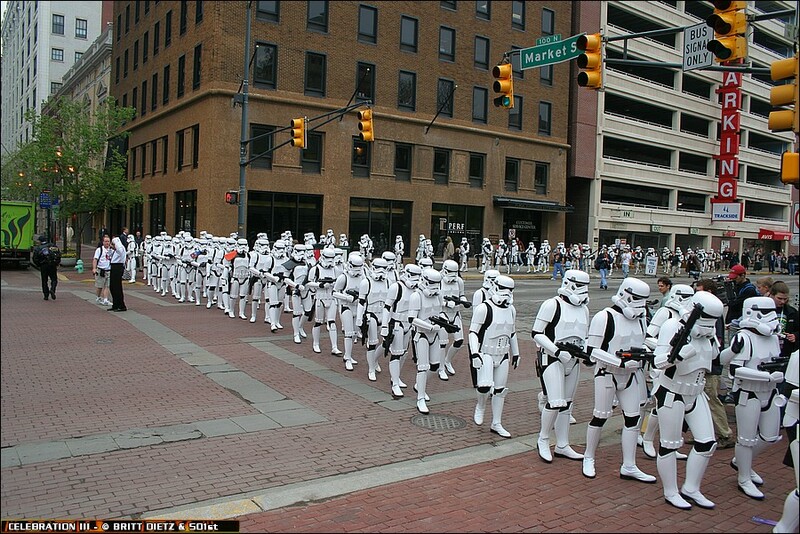 Leading the march, Tim (in stormtrooper costume) and I lead everyone into the Fan room, and everyone packed in the center. From a small group of people to an ever growing collection, it seemed like the line of people coming around the corner into the room was never ending, and it was at this point that I realized one major detail that had eluded Tim and I when we though about this room to shoot in, there weren’t any steps and we didn’t have a ladder for me to shoot on. The ladder was a big problem as it’d be near impossible to shoot this many people from ground level. In a panic, we tried to look around for anything for me to stand on to take the photo, but sadly there wasn’t anything tall enough or sturdy enough for me. With nothing else to lose, Tim send some runners to ask the bewildered Con staff to see if they had any ladders or lifts we could use for me to shoot. Word came back pretty quickly that they’d call a maintenance guy to see if there were any ladders in the back of the convention center. Thankfully, within a few minutes, a 12 foot ladder arrived and was set up for me. 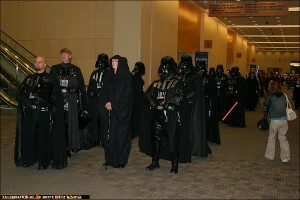 Now began the difficult task of organizing the photo, and there was only about 30 minutes left until the Con was open. Once the Con opens, it was game over as the flood of convention goers would surge into the room and it’d be near impossible to control the photo. With the Convention staff in a panic over the amount of people in the con already and trying to rush us saying they wouldn’t delay the opening of the Con, it was pure chaos… but at least it was warm. Climbing up really high on the ladder, I started to help Tim organize the photo giving him the range of my camera’s view so he could fit everyone in as best as possible. In a hurried rush, we made good time getting the various costume types organized into sections and starting to line them up. It was then I realized how I’d been so busy for the last few hours I’d not had any time to get breakfast, and I was starving. A good friend of mine who was giving me a hand had offered to go get me a McDonald’s Egg McMuffin sandwich, which I gladly accepted, but I wouldn’t be able to eat it until much later because of the craziness that would continue. As the photo was starting to take shape and the time till con opening rapidly approaching, the room started to get crowded with people who’d managed to slip inside, friends and significant others of the 501st members, Con staff members curious with what’s going on, and random people all wanting to get photos. Thankfully we were able to clear them behind the ladder I was on so they wouldn’t be in the shot, but they all wanted to get photos of the massive group starting to finally fall into place and were getting annoyed that they couldn’t get everyone into their shots. Some started to climb the ladder under me, and even the other side of the ladder where there were only a few support beams on the ladder, using them as steps. This shook the ladder quite a bit, and myself being actually (and ironically) not so great with heights, I was a bit fearful of toppling over. Eventually I had to ask everyone to get off the ladder, which was supported and enforced by a few friends of mine who were trying to help anyway possible. Finally being able to turn my attention back to the group, I realized that we were getting very close to being able to take the photo and getting this all done with! Suddenly, people started to cheer and look off towards the entrance to the large room. 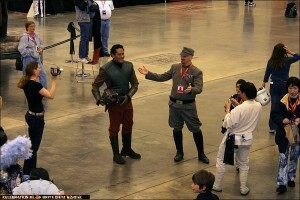 Trying to figure out what was going on, I suddenly saw the host of Star Wars Celebration III and actor from the Attack of the Clones movie Jay Laga’aia in the actual costume he wore at the beginning of the Episode 2 movie as Captain Typho! He had heard about the photo, got suited up in his movie costume, and wanted to join in on the photo. Naturally, no one protested and he jumped in front and center of the shot. Finally, it all came into place. Everyone was lined up and sorted and ready to go. Time was almost out for the photo, so we had to start shooting. Doing final checks and making some announcements to everyone as the room grew a lot quieter about making sure they can see the camera, I did a countdown from 3 to 1, and the shooting began. 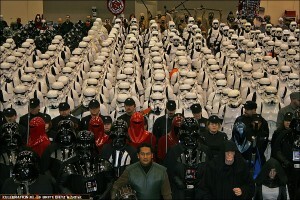 First up was the shot of everyone with Jay in the front in full costume with helmets on (which is called ‘buckets on’). I took as many photos as I possibly could during this time, making sure to get everyone in the shot and as high res as possible. Once I was satisfied with the photos I had, it was time to do a ‘bucket off’ photo where you can see everyone’s faces. Jay stepped out of the photo at this point since he had to go get ready for some of the first panels he was hosting, which was another reminder that we were running out of time. All that was left was the shots of everyone without their helmets or covers on, which takes a lot longer to do than most people would think. Some of the costumes are pretty elaborate, so it takes time and even an extra hand to help out to get their helmets off. It was as this was going on that a few people standing behind the ladder started to yell at me to get down off the ladder. Curious and annoyed that it might be the Con staff for some safety reason, I turned to see it was some of those random Con goers who’d slipped into the convention yelling up at me to get down so they could go up there and take photos with their cameras. Naturally, we didn’t have time for everyone to get their own personal photos, so I fired back at them that I was the 501st photo and I was their photographer. I must have been really frustrated and annoyed sounding, probably from the super crazy morning, because just saying that made them all go silent and they never said a thing at me for the rest of the shoot. Finally, with only about 5 minutes left before the Con were to open, everyone was ready for the final round of photos. Quickly snapping away as much as I could, we finished just in time to hear the PA announcement that the Convention Center was being opened for Celebration Con goers. We’d just barely made it. 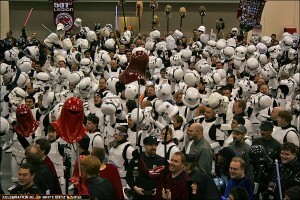 A giant cheer erupted and everyone lifted their helmets high into the air with a loud ‘501st! 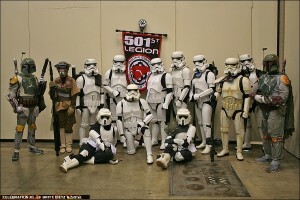 501st! 501st!’ chant. The chat grew louder and louder until everyone was taking part in it raising their helmets high. Everyone in the room had stopped what they were doing to either join in the chant or watch what was going on. It was a very memorable moment to have experienced in person, and a fun way to end the crazy shoot. A giant bit of relief came over me as I realized the hardest part was now over. I wasn’t done yet, however, as many groups of the 501st wanted photos and some wanted photos of all the stormtroopers together or all the bounty hunters, etc. I was running back and forth shooting two different groups at the same time it seemed trying to get through them all as fast as I could so everyone could leave and go about their day. This took another near hour to complete as a lot of the world wide 501st groups wanted shots of their own town/city/countries represented there at the Con. It was exhausting, and by the time it was all over and the last group had their photo taken and left, I went and found a nice little spot in the back of the room to slump down onto the floor and eat my now ice cold McMuffin that my friend had gotten for me a few hours ago. I was finally finished. 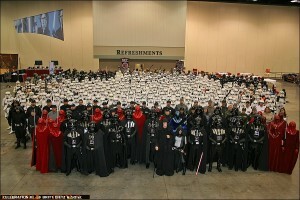 The photos from the shoot turned out great, and over 400 people made it to be in the shot. Overall people were happy with the photo, and it was used in many different publications over the years from magazines to books and can probably still be seen in a Star Wars book or two currently at bookstores. Sadly though, the whole ordeal would go down as being called by some a disaster causing a lot of controversy though myself and many others felt with the options that were given to us at the time we got things re-planned and done very well and as efficiently as possible. Regardless of the negative opinions, I honestly feel the photo turned out rather well with time crunch and everything rushed as it was. No matter what it was certainly quite the adventure and one of the longest mornings I’ve ever had, and probably one of the most memorable moments of ANY Star Wars Celebration that I have ever had! 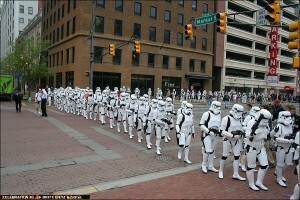 I’ll be posting more memories and fun stories of the various Star Wars Celebrations I’ve attended in the coming weeks! 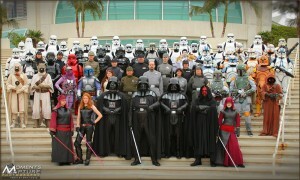 For everyone going out to Star Wars Celebration V in Florida next week, have a blast and may the Force be with you! 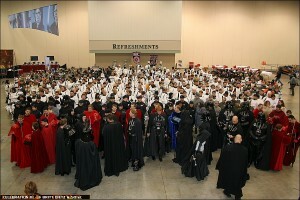 To see the complete gallery of photos from 2005 Star Wars Celebration III in Indianapolis, Indiana, click here! 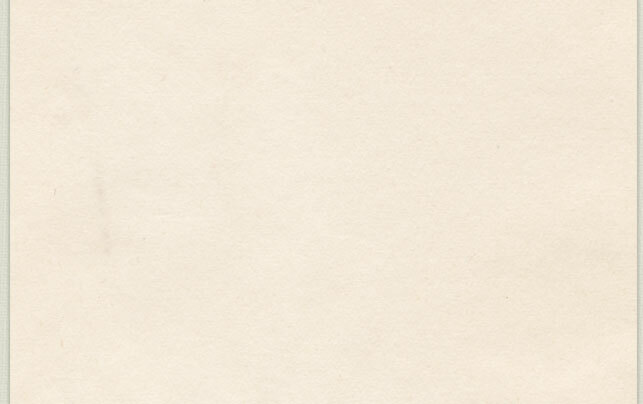 This entry was posted on Thursday, August 5th, 2010 at 3:45 PM and is filed under . You can follow any responses to this entry through the RSS 2.0 feed. Responses are currently closed, but you can trackback from your own site.